Visitors to Allegany County should watch where they step – there’s Poetry Underfoot. Poetic excerpts can be found at locations throughout the county, but their appearance is transient. Unseen on dry pavement, these words reveal themselves only when wet. The poems were selected from submissions by regional poets, including faculty and students from FSU, a physician/poet in Cumberland and a local Pulitzer Prize-winning poet. Students in FSU’s Department of Fine Arts fashioned the poets’ excerpts into stylized stencil templates. Browne and the CLA staff used the stencils to create the Poetry Underfoot installations using a spray that blocks water absorption on the exposed area. To explore the installations in the wild, grab an umbrella on a rainy day and go for a walk. Installations can be found by George’s Creek Library, Westernport Library, South Cumberland Library and Washington Street Library in Cumberland, Sadie’s Gallery in Frostburg, on Cumberland Street near the Market Street Bridge in Cumberland, on Broadway Street in Midland near the post office boxes, near the crosswalk on Legislative Road in Barton, near Boal’s Funeral Home in Barton, by the Gira Center on the FSU campus and on Water Street in Frostburg near the College Avenue intersection. Sponsored by a Creative Placemaking grant from the Allegany Arts Council, Poetry Underfoot is a collaborative project among the FSU Center for Literary Arts, regional poets and students from the FSU Department of Fine Arts. To read the Poetry Underfoot poems in full, visit www.frostburg.edu/CLA. 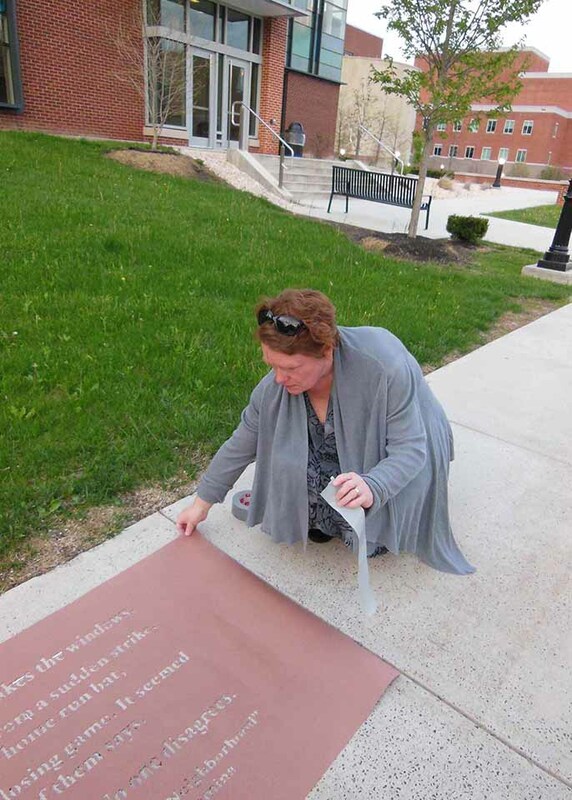 Jen Brown, director of Frostburg State University’s Center for Literary Arts, prepares a stencil to create a Poetry Underfoot installation on the FSU campus. 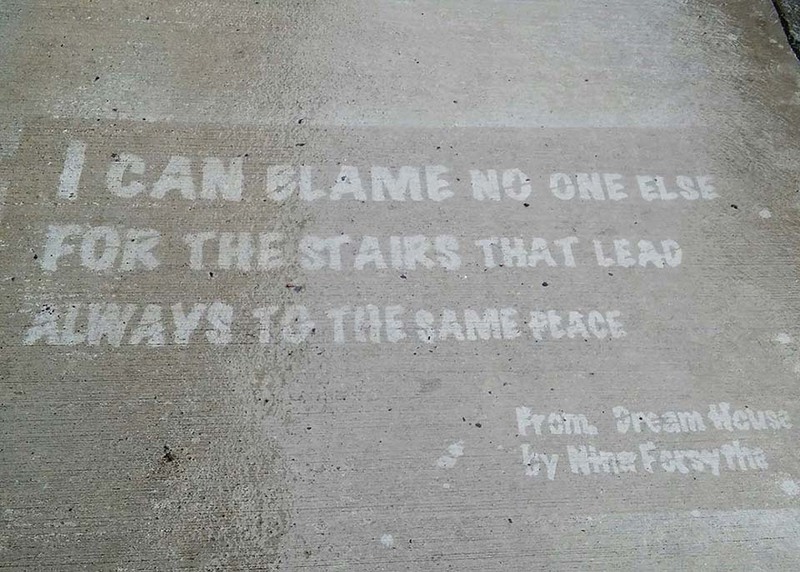 One of the Poetry Underfoot installations, which only appear in the rain, features the work of local poet Nina Forsythe.